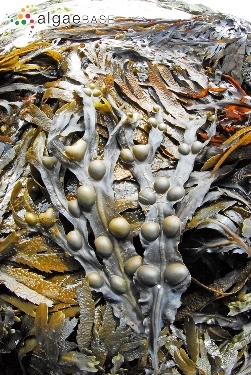 Welcome to the world of Fucus vesiculosus AKA Bladderwrack! Who cares about a brown algae? The brown alga Fucus vesiculosus is one of the most prevalent species of algae in the north Atlantic Ocean. The species provides food to a lot of organisms that live near the shore in the northern Atlantic, and it is almost certain that megafauna such as Britain's harbor seal would not be around if it were not for this primary producer. Fucus vesiculosus also provides multiple compounds that are useful to humans, from helping people lose weight, to curing a goiter caused by iodine deficiency. You can learn more about thes by going to the implications page. You can also learn more about literally thousands of algae by going to algaebase.org. Fucus vesiculosus gets its common name, bladderwrack, from the air bladders that are present in pairs on the blade of a plant-like structure called a thallus. The picture to the left shows this feature very well. Why is bladderwrack so brown, and not the green that most people associate algae with? Well, you can learn about this by visiting the adaptation page. What does this thing eat? Bladderwrack is not a plant, so how does this food get its nutrients? It goes through the exact same process that plants do. To understand this process, and how F. vesiculosus gets the rest of its nutrients, check out the nutrition page. Once you have finished searching through all the information that is presented on this site, you can find more information on very diverse organisms by visiting multipleorganisms.net, a site created by Dr. Thomas Volk and many of his students. This site provides information on hundreds of organisms from the Bluegill Fish to the Mandarin Orange. My name is Ben Harris and I created this website for my Organismal Biology class at the University of Wisconsin - La Crosse and last updated it on April 13, 2011. You can learn more about me by going to the About the Author page. I would just like to give a special thanks to Ester Serrão of the University of Algarve in Portugal. She was instrumental in the creation of this website, and if you look at my references page, you will see that I used quite a bit of her research. She also gave me numerous pictures of F. vesiculosus that you can find throughout the site. You can learn more about Dr. Serrão's research by visiting her website here.